UAVs are fundamentally changing our world. From use in conservation, humanitarian relief efforts, precision agriculture, and a myriad of other commercial applications, more people are realizing the benefits UAVs can bring for changing businesses for the better and saving and improving people’s lives. A growing diversity of markets and applications are creating substantial opportunities for developers and sellers—for technology, data, and remote sensing companies—and for end-user corporations. And what’s more, both the developed and developing worlds are benefiting. The massive floods and landslides in the Balkan region back in early 2014 meant that landmines left over from wartime became displaced and posed a real danger to human life, not only after the disaster when the flood waters receded, but also during the relief effort. 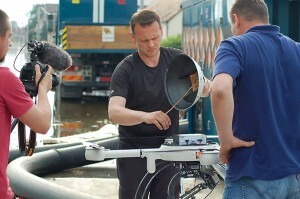 Organizations, including the European Union’s ICARUS Unmanned Search and Rescue Project, were dispatched to help. dozen locations with the objective of capturing photos that could be used to identify displaced mines and also determine their direction of travel via geo-statistical modeling. These images had the added advantage of showing areas of infrastructure damage that could be quickly viewed, prioritized, and addressed. UAVs have also made a fundamental difference to relief efforts after the recent disasters in Haiti and the Philippines and at earthquake areas in the United States. NASA’s unmanned research aircraft Ikhana B has a wingspan of 66 feet and is 36 feet long; it can carry more than 400 pounds of sensors internally and more than 2,000 pounds in external under-wing pods. Credit: NASA/Carla Thomas. Several countries, including Tanzania and India, are deploying UAVs to keep an eye on poachers and monitor wildlife. Some conservation UAVs are capable of flying for around 30 minutes, covering a range of 30 km to 50 km (18.5 miles to 31 miles), and constantly relaying real-time images and video back to base. They’re even capable of operating in the dark with night-vision cameras. Because of these capabilities, it’s said they can do the work of about 50 rangers. The UAVs can get right into hard-to-penetrate forest areas and deliver data quickly and directly to the experts, saving time and human error and speeding up the decision-making process. Aside from association with the military and their use in war zones, there is a tendency for the general public to view UAVs as relatively small, multi-rotor helicopter-type flying machines. But any unmanned vehicle that flies above the ground, no matter how high, is a UAV. And things are happening at extremely high altitudes. Take, for example, the UK Astronomy Technology Centre, which plays a large role in Earth observation for the benefit of our environment and is at the cutting-edge of astronomical instrument development. 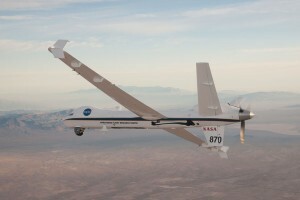 They are currently working on a project to fly a spectrograph on a NASA UAV to measure greenhouse gasses over the Pacific. Some reports forecast the size of the global UAV market to have exponential growth to over $8 billion by 2018. But major challenges will remain in the form of technology compatibility, choice of platform, privacy issues, and delays in active legislation for commercial use. 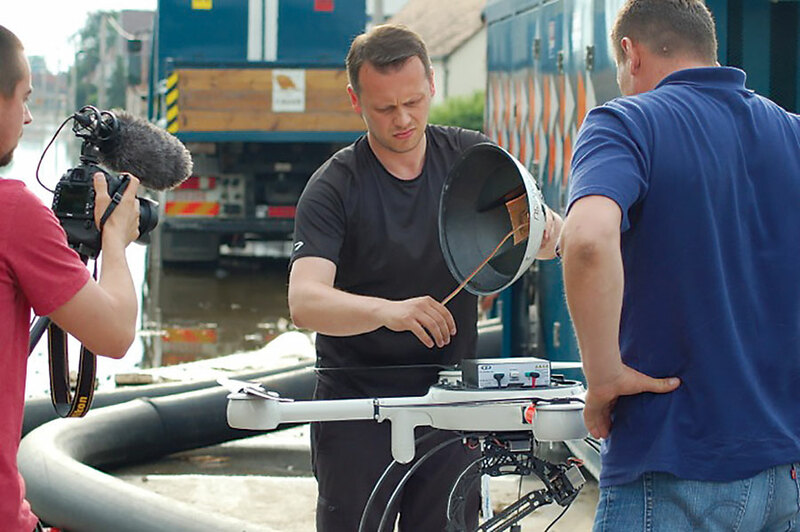 Haris Balta (in black) of the Royal Military Academy of Belgium performs a UAS inspection and assessment flight for the Belgium First Aid and Support Team in north Bosnia after massive floods there. In blue is Esad Avdic of the Bosnia and Herzegovina Mine Action Center. calculate tree canopy density or water depth. And these will just be the tip of the iceberg. One burgeoning area will be for companies who understand technology, can manage and manipulate big data, and are able to take the data collected from a sensor-carrying UAV and deliver that data in an easy-to-understand, beautiful format for the end-user. Sticking a sensor on a UAV and flying it around is one thing. Making sure everything at the ground level and all the data are retrieved, sorted, and displayed correctly is quite another.